Analysts at Fitch Solutions are feeling bullish from spot levels on nickel, lead, copper, tin and gold over 2019, but are bearish on iron and coal, according to new reports on mining the Americas. Fitch forecasts the mining industry recovery will continue on track, supported by a strong project pipeline and a positive outlook for prices from 2018's rout. 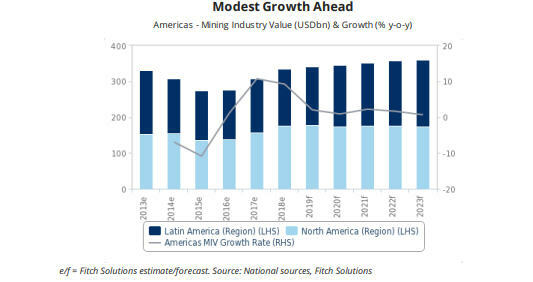 The analysts predict miners will remain committed to supply and capital restraint, prioritising joint ventures and brownfield investment, and that a strong demand for cobalt, driven by the rapidly growing electric vehicle and battery storage sectors, will prompt significant investment in this nascent mineral sector in the Americas. Copper will remain at the forefront with firms sprinting towards acquiring additional capacity for the same reason, the report reads. Canada's cobalt sector and Ecuador's budding mining sector for copper and gold will be investment hot spots, analysts contend. Peru and Chile will continue to attract copper investment, currently accounting for 64% of new copper projects for Latin America in Fitch’s Global Mines Database.